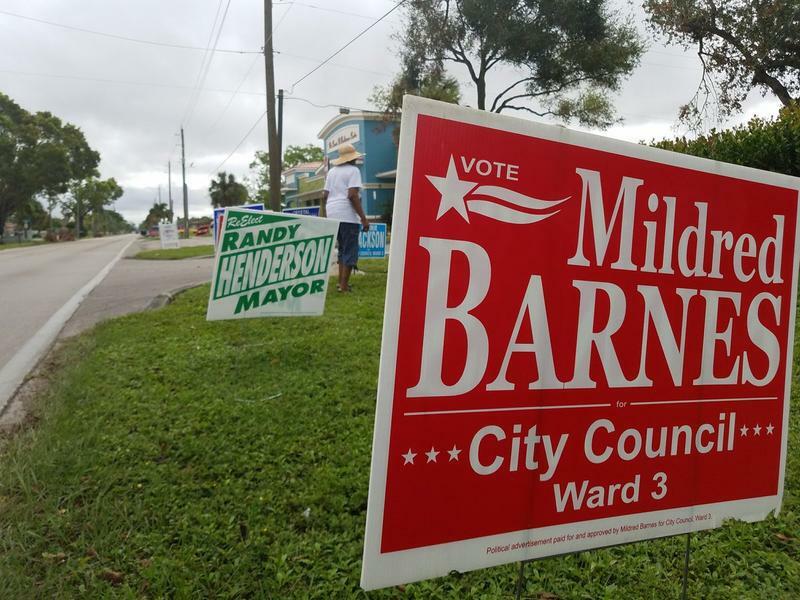 Campaing signs outside of the Carrie Robinson Community Center in Fort Myers. Fort Myers incumbent Mayor Randy Henderson won 71% of the vote, automatically winning a third consecutive term. For city council races, ward 3 incumbent Terolyn Watson and Minnie Jackson advance to a runoff election in November. In the ward 5 race, Fred Burson and Lydia Lowell-Sherman also advance to a November runoff. Tuesday is the Primary election for Fort Myers and Cape Coral mayoral and city council seats. The election was originally scheduled for September, but was postponed because of Irma. St. Hillary’s Episcopal Church off of McGregor Boulevard is a polling place and there was barely anyone there. But Lee County Elections said many people already voted by mail. As of Tuesday afternoon, their website showed nearly 16,000 mail-in ballots calculated. And fewer than 100 in-person votes counted. Nancy Cox came mostly to vote for mayor. "Well, I didn’t vote for the mayor we have now. I wasn’t happy with him with the problems in Dunbar with the sludge—denying that he knew about it, which I’m sure he did," said Cox. "And I don’t like what’s happening with the police department. So, I’m hoping that this man that we voted for might change things for us." The incumbent Fort Myers mayor, the one Cox said she is not voting for, is Randy Henderson. He’s been mayor since 2009. Henderson is promising continued growth for Fort Myers. Curtis Sheard who’s running on a platform of more equity among residents and businesses. And Nicole Dillon, who’s running on a platform of addressing gun violence and homelessness. Lydia Lowell-Sherman is running for Fort Myers City Council, Ward 5. She was campaigning at St. Hillary’s Episcopal Church. "I’ve lived here my entire life," said Lowell. "And I wanna help the expansion they’re doing in this city." There’s also a Fort Myers City Council seat open for Ward 3. In Cape Coral, there are seven candidates running for mayor. Residents will also vote for Cape Coral City Council spots in districts one and four. The general election, which will have the top two mayoral candidates and city council candidates, will be in November. The polling places close Tuesday at 7 PM. Click here to listen to the radio story. Florida’s Department of Environmental Protection used ground penetrating radar on several plots of land in a predominantly black section of Fort Myers this week. For decades the City of Fort Myers used one of the plots to dump lime sludge, a by-product of water a treatment plant. That lot is being tested, along with nearby private properties and water wells, after residents found out and became concerned. 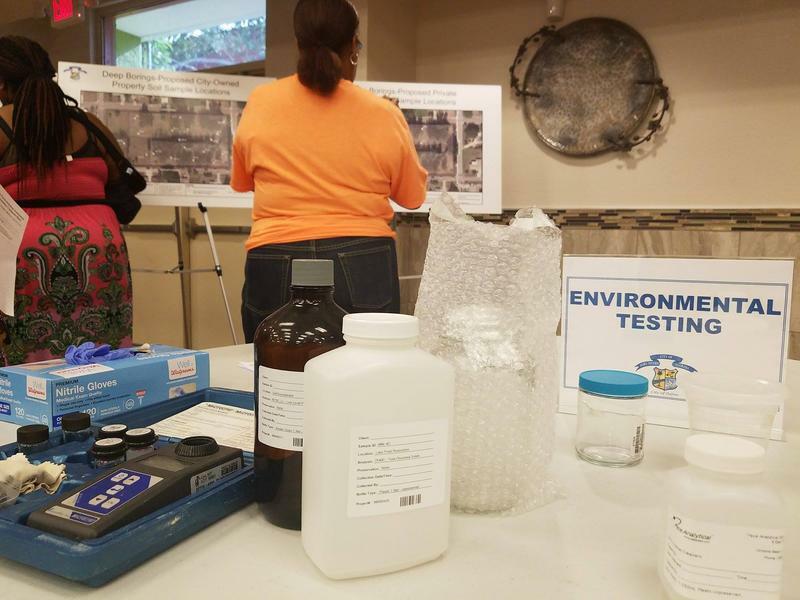 The City of Fort Myers held a workshop this week to inform residents about what kind of testing will be done on a dump site in a predominantly black neighborhood. Back in the 1960's, the City dumped a byproduct from a water treatment plant in an empty lot in the neighborhood known as Dunbar. For decades, the city didn’t tell residents what that byproduct was. It included arsenic.